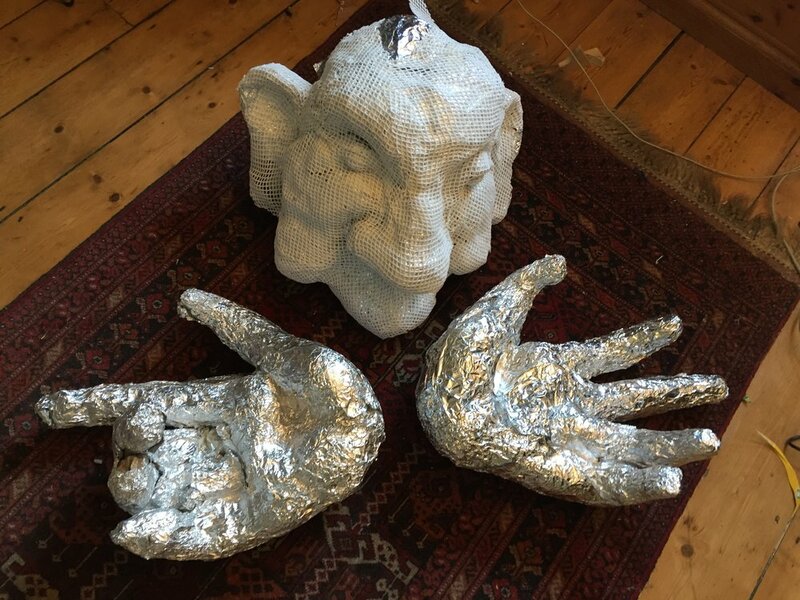 Created as part of the 'Hampton Folk Tales' festival the 'Giant from the Tump' was designed through workshops conducted across primary schools in Peterborough throughout Spring 2017. Botch Puppets' Rosa Douglas was the lead puppet artist for the project. Rosa created a series of workshops for children that guided them unknowingly through a design process. Imagination games, craft activities and story telling sessions allowed the children of Hampton, Peterborough to engage with the idea of a mythical giant living in their midst. They put forward ideas about how this giant looked, why it was here and why it might choose to reveal itself. Rosa took their most thoughtful ideas and combined them into one design for a puppet that she then built. It was showcased in September 2017 in the final festival parade. 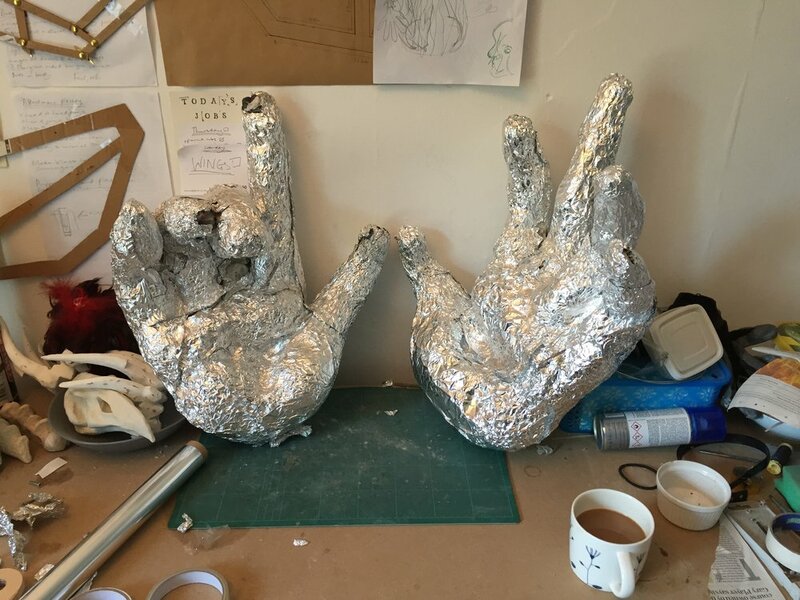 The head and hands of the giant were sculpted in newspaper before being covered in foil and used as template blocks for a vacuform shell. Children from Hampton Vale primary school took part in a natural dying workshop to make fabric swatches for the puppet. This workshop arose as a direct result of an earlier idea a child proposed of the giant having been pulled up from the earth. The children mixed dyes using fruit and vegetable peel with boiling water. The results formed part of the finished creation. 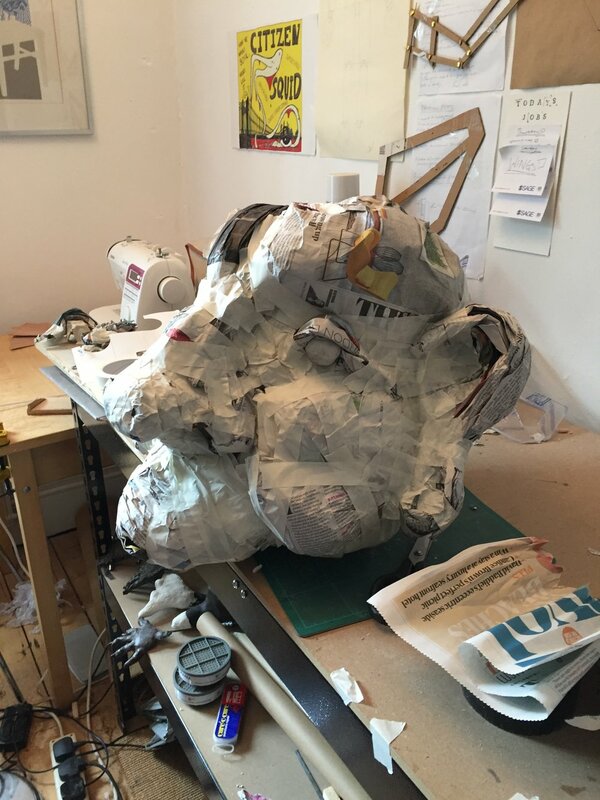 The giant ended up being a large-scale, carnival, backpack puppet with aluminium frame supports and PVC piping chest plate. A large portion of the materials were taken as remnants from building sites and skips. Found objects and recycled papers were also used. The puppet was built by Rosa over the course of three days with the idea that textiles would be added to its cloak and arms by school children on the day of the parade. The giant was brought to life on September 16th by the children of Hampton.